At Yieldmo, the account manager is the primary point of contact between the company and its clients, once an IO (insertion order) is signed. They manage all post-sale activity for a book of business, consisting of up to 25 agency and/or direct response client accounts. In addition to maintaining these accounts, the account manager also owns the creative metadata for all of their clients. This includes editing all elements of the ad creative, such as labels, URLs, images, CTAs, as well as campaign details (campaign names, ad group, flight dates) and trafficking elements (trackers, TPI’s, tags), budget caps, budget types, and bidding information. Bulk Management enables account managers to make configuration changes to many creatives at the same time, in one action. Using this tool was faster and easier than editing creatives one at a time in the Ad Builder or Admin tools they also had access to. It allowed them to quickly manipulate data using an Excel spreadsheet on their computer, and upload creative changes as a CSV file. Despite the usefulness of the tool, it was prone to human error, and missing several features that limited its capability. Support all of Yieldmo ad formats. Clear, actionable validation errors and path to resolution. Improved information hierarchy for ad formats in the application. Support the users within the workflow, with tooltips and suggested prompts. No support for complex brand formats. The tool could only edit a small set of ad formats. Validation too succinct or completely missing. All errors encountered during the CSV upload produced the same generic message for the user. Limited editing capabilities. The tool did not support changing simple things like campaign names, group name, and ad group name, without duplicating the creative and creating a new one. Before we did any design work, we wanted to fully understand the day and life of an account manager, so we spent several days shadowing them to see how they managed their workload. We found that, not only do they spend time working with CSV files and using the Bulk Management Tool, they spent a lot of their time on calls and meetings with clients. We also learned that they had numerous custom workarounds to get the results that they needed. For example, some would only make CTA copy changes in the morning, upload the csv, then focus on other adjustments like adding tags or trackers to the ad format in the afternoon. Once we fully understood the goals of the new Bulk Management Tool, we set out to create high level wireframes. We wanted to be sure that the flows would shorten the time that the account managers spent in other applications working around the Bulk Tool’s limitations. 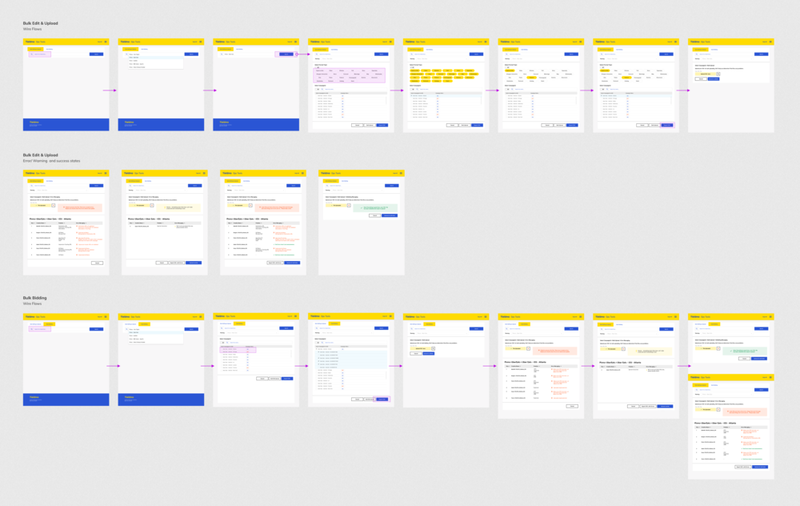 We tested the account managers with a design prototype using InVision to confirm that they understood the new workflows and that we had met all of their requirements. After we validated that the flows were successful, we collected more feedback and continued to iterate on the design, before starting to build the new tool. During the build, we continued to prototype and iterate on the design, until we had our first beta complete of the application. With so many errors and bad validation, account managers would use one csv and do one change per type (e.g a row of URL changes) then upload, then download the csv again and make additional changes. Account directors worked with account managers to support clients, but then sometimes would have to hand over creatives and files to campaign operations analysts to serve and make adjustments to the content this resulted in a lot of incomplete work, frustrations and unorganized files. Account managers slowly and carefully edited CSV files with their creative changes. Despite this, it was hard to avoid validation errors and they spent a lot of time troubleshooting and manually QAing. Account managers with clients using ad formats that weren’t supported by the Bulk Management Tool were forced to do half of their work in another program. This increased the time to make any changes to creative. Due to the poor validation and number of errors, some account managers began uploading several CSV files one at a time, each with a single element change, so QA would be easier. The time that account managers spent using the Bulk Management Tool was cut drastically, allowing them to spend more time speaking to clients. Eliminated all custom workarounds. All bulk editing could happen within one CSV file. Validation and error messaging helped drastically in improving the workflows for the campaign operation analysts. Validation successful messaging after a csv has been uploaded.